The threat of less central bank stimulus and higher interest rates has crushed emerging markets more than most assets in the past two months, in some cases slashing the value of stocks and bonds in developing countries to levels not seen since the last financial crisis. The slump after US Federal Reserve Chairman Ben Bernanke signalled in May that the Fed expects to curb and then end its bond-buying program in the next year if the economy improves has pushed prices to levels that would have looked very appealing only a few weeks ago. And some emerging market investors are buying, even with the understanding that there is a big risk markets have further to drop. "We're starting to selectively increase our exposure to emerging markets," said Andres Calderon, portfolio manager and vice president for research at Hansberger Global Investors in Fort Lauderdale, Florida. "But the key word is selective. We're not rushing in." There is every reason to be cautious: Many fund managers expect lower growth in emerging markets. Some markets have suffered recently from steep capital outflows, and the slowdown in China has affected other emerging economies, particularly commodity producers. Still, emerging markets are expected to continue to grow faster than developed countries. Northern Trust Asset Management, for one, has remained overweight in emerging market stocks through the slide. The Chicago-based firm manages $810 billion in assets. "If you're worried about performance in the next one or two quarters, then it's hard to make a case about a visible catalyst for emerging markets," said Jim McDonald, Northern Trust's chief investment strategist. "But if you have a 12- to 18-month outlook, then this group will work." He said emerging market stocks are trading at around 10 times this year's earnings, or a 32 per cent discount relative to the Standard & Poor's 500-stock index. The asset class's historic low is about eight times earnings. Emerging markets have typically traded at a 20 per cent discount to the S&P 500 since 2005. The price-to-book ratio of emerging market stocks on the MSCI stock index is also showing sharp undervaluation at 1.45, not far from the low of 1.36 hit during the depths of the financial crisis, according to Morgan Stanley data. That is still far higher than the 0.93 reached during the Asian crisis of 1997-98. The price-to-book multiple measures the company's value if it goes bankrupt. "I wouldn't be surprised, though, if EM stocks come down further because there would still be continued outflows from the sector," said Calderon of Hansberger, which is a long-term investor in emerging market equities, with assets of around $6.2 billion. There is plenty of wreckage to survey for possible bargains. The benchmark MSCI emerging market stock index is down about 11.3 per cent this year, with much of the decline coming in the past six weeks. By contrast, the MSCI's all-country world equity index is still up 4.8 per cent this year, while the S&P 500 sports a sizable 12.8 per cent gain for 2013. In the debt market, the emerging market bond yield spread on dollar-denominated bonds, a gauge of perceived risk over safe-haven US Treasuries, was at 342 basis points on Thursday on the benchmark JP Morgan Emerging Markets USD Bond Index (EMBI ). On Tuesday, the spread was its widest in more than a year. This index has fallen about 6 per cent in June and is down more than 10.7 per cent this year, after gains of more than 18 per cent in 2012.
markets are experiencing a slowdown in demand for exports because of the weakness of the world's major economies. 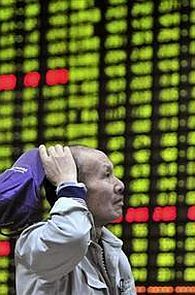 China's downturn has had a severe impact on many developing economies. "China is likely to be far less effective as an engine for global recovery than in previous episodes such as 2009," said Bhanu Baweja, an investment strategist at UBS in London. J.P. Morgan, in its June 28 research note, has reduced its growth forecast for emerging markets as a group in 2013 to 4.6 per cent from its previous estimate in March of 5.1 per cent. The US investment bank has also lowered emerging market growth in 2014 to 5.1 per cent from its initial forecast of 5.4 per cent. Still, those growth numbers are way above estimates in developed markets, which are forecast to grow just 1 per cent this year and 1.8 per cent in 2014, J.P. Morgan data show. Brazilian government bond yields maturing in 2021 have risen by 245 basis points since May, while Mexican bond yields have increased by 144 basis points, according to Morgan Stanley. The firm's latest emerging market bond models suggest those markets are now undervalued. "The selloff in Mexico is not justified," said Nicolas Jaquier, emerging market debt economist at Standard Life Investments in London, which manages assets of $272.6 billion. "Growth in Mexico has come down a little bit and it's going through a soft patch, but that is good for bond investors because that means the central bank could cut rates again this year if growth continues to soften." Standish Asset Management, a $170 billion fixed-income investment firm in Boston, has bought local Mexican and Brazilian bonds as yields have fallen since the May selloff. The average yield on emerging market local bonds is about 6.2 per cent, Standish said, or about 100 basis points higher before the selloff in May. "Many investors are comfortable with the currency volatility attached to these local bonds, and the expectation is that in the medium term, emerging market currencies will appreciate," said Alexander Kozhemiakin, managing director and emerging markets debt team leader at Standish. Near-term risks in emerging market currencies have declined, since many of the aggressive bets in favor of these assets have been reduced. For instance, net longs - bets a currency will rise - in the Mexican peso, the most liquid emerging market currency, tumbled to around $812 million, the latest data from the Commodity Futures Trading Commission show. That is down sharply from roughly $6 billion in April. Long positions in the Brazilian real and Chilean peso have also substantially fallen, according to Morgan Stanley data. There is still a risk of further outflows from the local currency debt sector, fund managers say. Morgan Stanley data shows emerging market institutional investors are still overweight on local debt relative to their benchmark, suggesting more room to pare positions should markets remain scary. "When you see that exposure indicator going down, that's a sign that the market is starting to clear their positions and therefore there would be a sense of calm," said Rashique Rahman, global head of emerging market strategy at Morgan Stanley in New York. Analysts at Bank of America/Merrill Lynch said in a Thursday note that institutions they surveyed are raising cash in expectation of outflows, as investors respond to the volatility. Once that is alleviated, the case for long-term bets becomes clearer, fund managers said.